Port Everglades Recognized Internationally as Seatrade Insider's "Cruise Port of the Year"
Port Everglades Recognized Internationally as Seatrade Insider&apos;s "Cruise Port of the Year"
BROWARD COUNTY, FL - Modernizing its cruise terminals to be more operationally efficient and customer-friendly has earned Broward County’s Port Everglades the title of “Port of the Year” by Seatrade Insider, one of the world&apos;s foremost cruise industry trade publications. 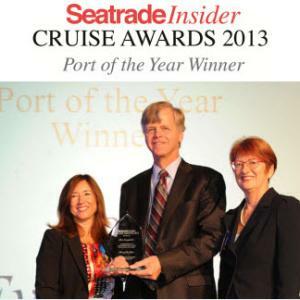 Port Everglades was shortlisted in mid-August along with Kirkwall in Orkney, Scotland, and the Port of Toulon in France by a panel of judges comprised of executives with experience in relevant areas, members of Seatrade Insider&apos;s global editorial team, cruise consultants, analysts and association experts from around the world. The announcement came today during the Seatrade Europe cruise industry trade show in Hamburg, Germany. “This is an incredible honor for Broward County and Port Everglades because the Seatrade Insider Cruise Awards are judged by an independent panel of experienced cruise industry specialists,” said Broward County Mayor Kristin Jacobs. Port Everglades also received the prestigious award in 2010, after the South Florida seaport completed the world’s largest single-ship cruise terminal, which is designed to allow embarking guests to begin the check-in process while debarking guests are processed in a separate location within the same facility. This year, Port Everglades was nominated for completely renovating, expanding and updating four existing cruise terminals that are used primarily by cruise lines owned and operated by Carnival Corporation. Cruise Terminals 2, 19, 21 and 26 were part of a $54 million makeover that transformed older facilities into modern, world-class, guest-friendly cruise terminals capable of processing debarking and embarking cruise passengers simultaneously. Port Everglades is one of the three busiest cruise ports in the world. Eight cruise lines, one ferry and more than 40 cruise ships sail from the South Florida seaport including: Balearia’s Bahamas Express, Carnival Cruise Lines, Celebrity Cruises, Cunard Line, Holland America Line, Princess Cruises, Royal Caribbean International, Silversea Cruises and Seabourn. The Port&apos;s wide-ranging fleet of cruise ships provides guests with an array of cruise vacation choices from the sunny Greater Fort Lauderdale area. Port Everglades is where the best cruise ships launch and the greatest getaways begin. View details on the latest cruise offerings at porteverglades.net or contact us by emailing PortEverglades@broward.org. Photo Caption: (l-r) Christine Duffy, Cruise Line International Association; Steven Cernak, Port Everglades CEO & Port Director; Mary Bond, Seatrade Insider.